This web site my alternate site for steampunk related items. At present, it is just a stub. 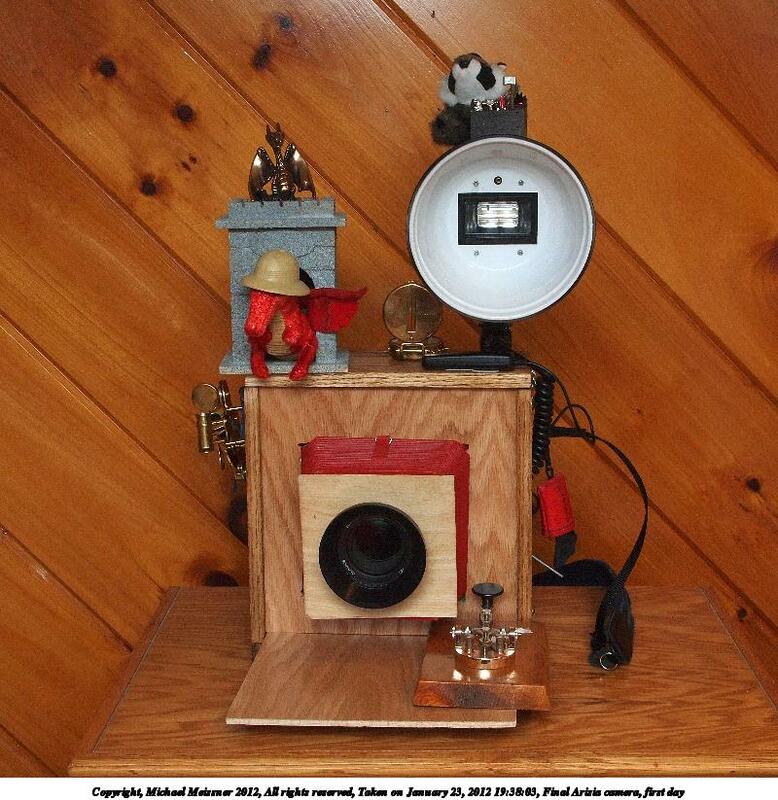 I have uploaded the slides of my talk about the evolution of my steampunk cameras here. 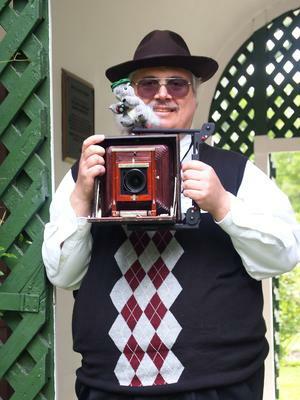 http://www.the-meissners.org/photo-ren.html (my renaissance faire and steampunk pictures). http://www.the-meissners.org/photo.html (all of my pictures). http://www.the-meissners.org/index.html (my boring normal web site). http://www.the-meissners.org/camera-gear.html (my current camera gear). I've had a fascination with the images of news photographers from the 1930's with the classic Speed Graphic and large flash taking pictures of events of Hollywood celebrities, and I've been on a quest to replicate the look, but using digital cameras. Along the way, I've gone through several iterations of the design. I finally can zoom the lens. 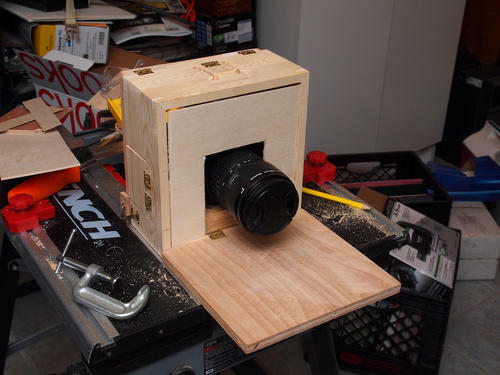 In previous incarnations, I had to open up the box to change the zoom setting on the lens, so I tended to treat it as a fixed lens camera. 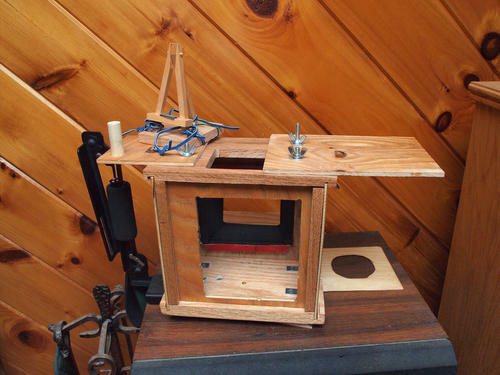 Now, I have a wooden embroidery hoop with leather wrappings that fits snuggly on the lens, and connected to the hoop is a long screw, that goes through a slot in the side, and I can move it up or down to zoom out the lens. This box is now 9 inches on each side, instead of the previous 8 inches. 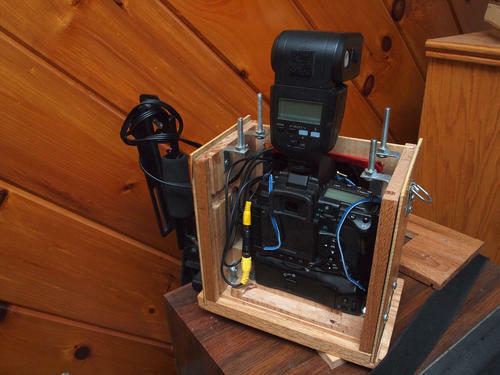 I found the tolerances were rather close on the smaller boxes, and I broke 3 shutter release cables. I've upgraded cameras to the Olympus E-5, and it needs a little bit more room for the video out cable than my previous Olympus E-3, and the larger box helps with this cable as well. In addition, the top is high enough so I don't have to cut a hole for the flash, instead I use a flash cable and attach the flash on top of the box. In addition to having better support for the wired shutter release, I also have an openning on the bottom right side, so that I can shoot with the shutter button attached to the HLD-4 portrait grip. I find in practice, I tend to prefer this button over the shutter release. I did more finish work on this box. I used brass screws to attach the sides to the box, applied two coats of stain, and sanded the box to make it look more finished. 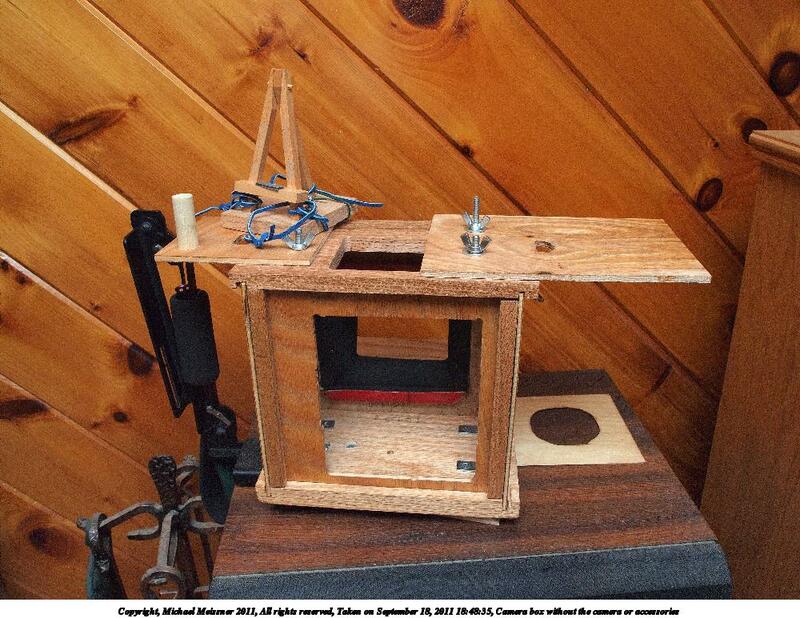 For the The Great New England Steampunk Exhibition in September 16-18, 2011, I make an oak box (3/4" oak on the base, 1/2" oak on the sides). Like many steampunk things there is a lot going on, and the critters and attachments vary by the day and my whim. 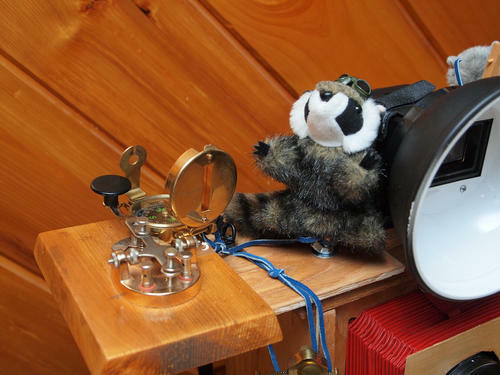 I have a steampunk raccoon (Racky) as one of my mascots. He has goggles, a watch, and a top hat. I have a painter squirrel (Livinia) as another mascot. The canvas that she is painting is a JXD i696 portable mp4 player. This player takes video input and I feed the live view output from the camera into that, so it looks like she is painting the image. I searched around ebay to find a small device that took video input, and took replaceable batteries (Nokia 5C in this case) that are generic and easy to obtain. 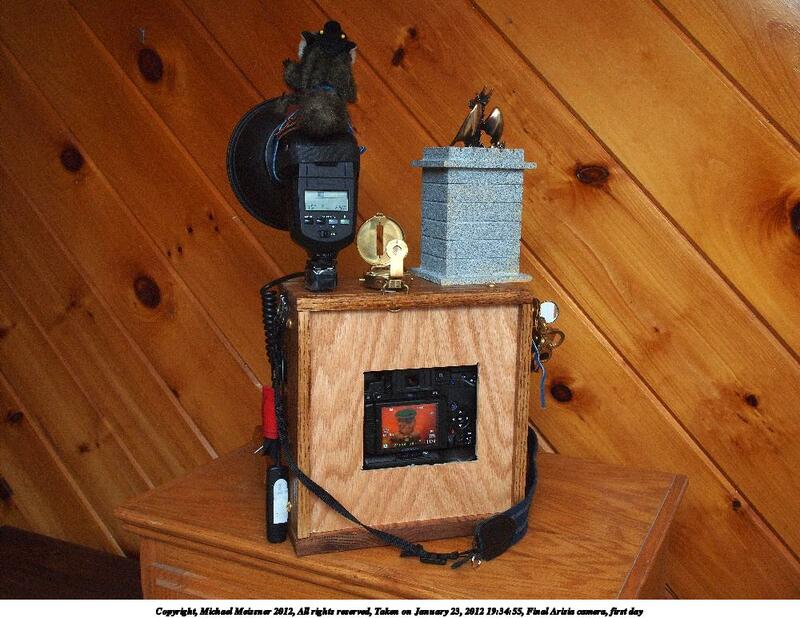 Unfortunately, most of the devices either have a fixed battery or uses a propritary battery. I did have some issues with batteries on the first day, as I hadn't fully charged all of the batteries the night before. I need to make this look better and more steampunk-ish. I have a telegraph, compass, and sextant hanging off the camera. 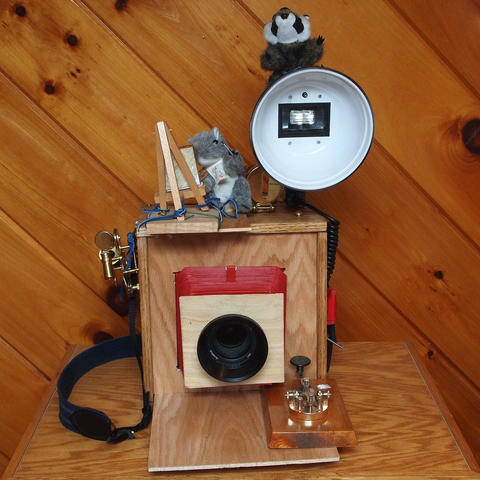 I use the spiel that I call it my CEL system, because I can Chat with the telegraph, Envision with the camera, and Locate myself with the sextant and compass. I can zoom the camera lens with two leather laces hooked up to a hoop that sits on the zoom lens, and by pulling either lace, it will turn the zoom lens. 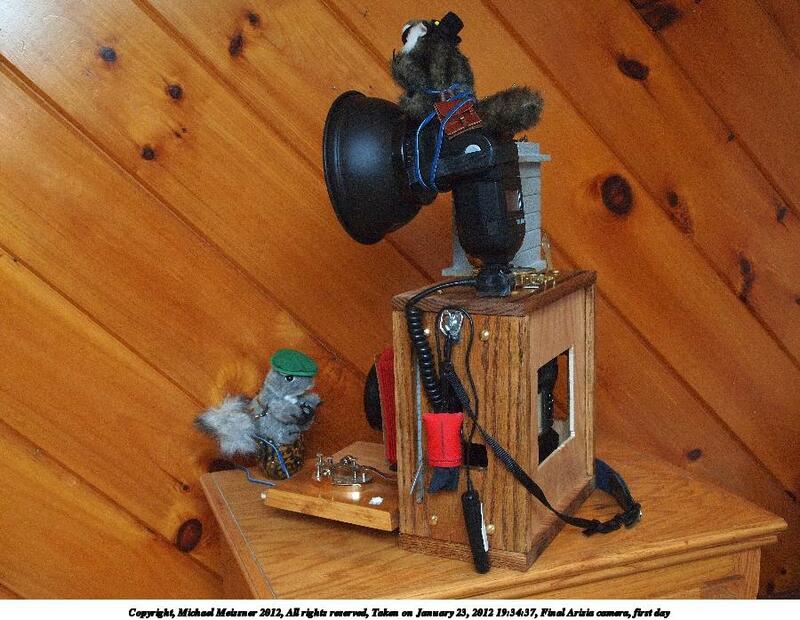 I have the camera setup for using a wired or wireless shutter release. During a trial run with the box the week before, I discovered that I had yanked out the shutter release cable, breaking it. 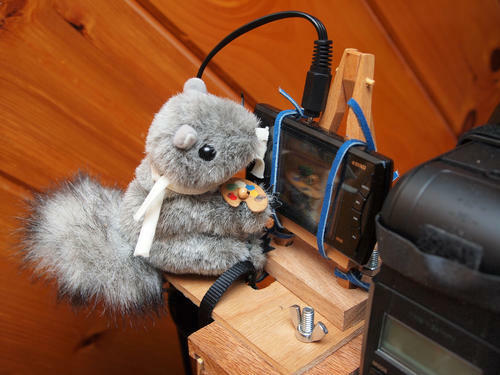 Fortunately, I had just gotten a 3rd party wireless shutter release that fit, but as a backup, I had drilled a hole in the side, so I could use the shutter release button on the HLD-4 battery grip, and I find I like that much better than a shutter release cable. In this iteration of the box, I bought the HLD-4 battery grip for my E-3, that will allow me to change batteries without having to take the unit apart. On the box I used during Arisia, 2011, I had a hole cut on the bottom to change the battery, but in practice I had to take all of the mascots and accessories on the top off and turn the unit on the side to replace the battery, and this is much better. 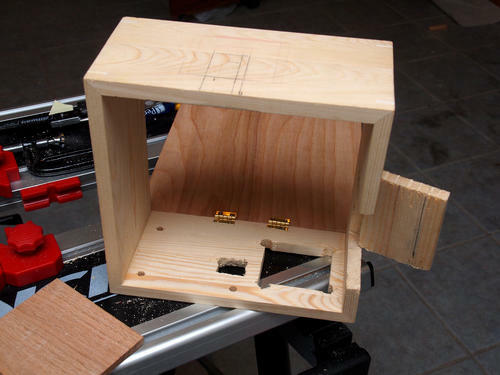 I use 1/4-20" screws to attach the box, and I can take it completely apart if I need to transport the box via air travel. 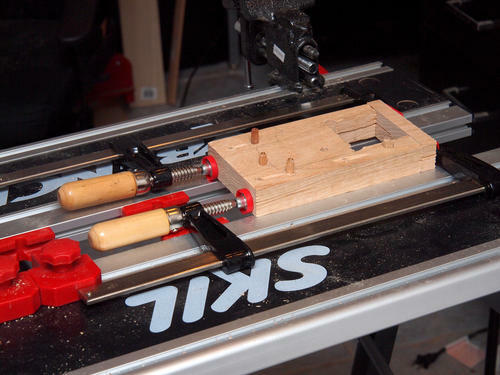 I have more pictures documenting the build at http://www.the-meissners.org/2011-small-albums/2011-hide-camera/index.html. 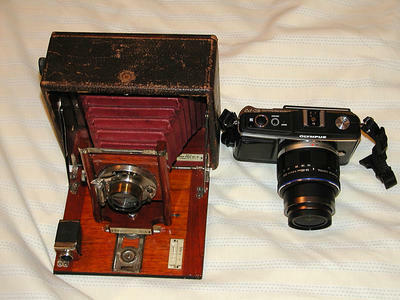 The first camera that I bought was the Seneca Chautauqua 4x5 large format camera. My wife and daughter declared this was too nice of a camera to ruin by putting my camera inside, so it has mostly sat on the shelf looking pretty. 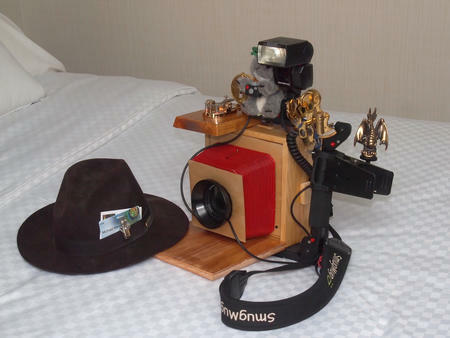 I did take it to the Arisa science fiction convention with the Olympus E-P2 mounted on top. 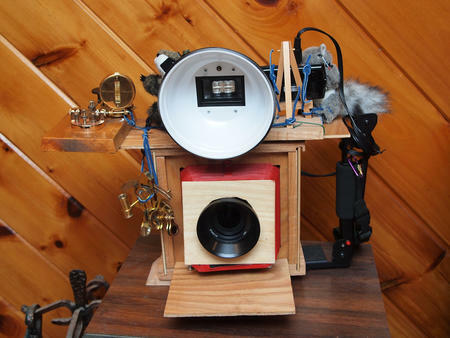 The reaction to this camera convinced me to really persue the goal of trying to disguise my camera. 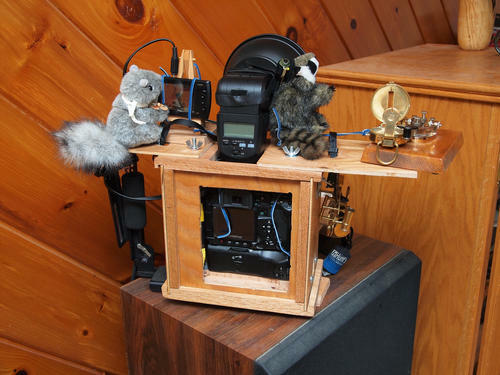 I have more pictures of the Seneca at http://www.the-meissners.org/albums/camera-hacks/index.html#chautauqua. 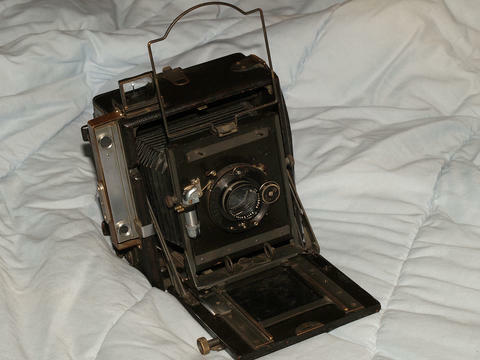 After buying the Scenca, I looked around on ebay, and eventually won an auction of a Folmer Grafex Speed Graphic from 1939. 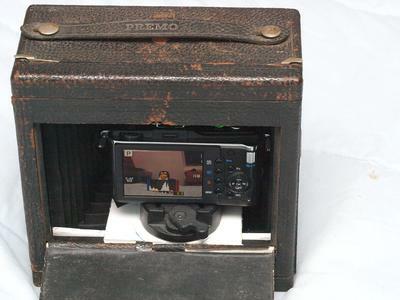 When I got it, the Speed Graphic looked to be in reasonably good condition, and I paid to get it restored. Sooner or later, I hope to run real film through the camera, so I'm saving the camera for that. 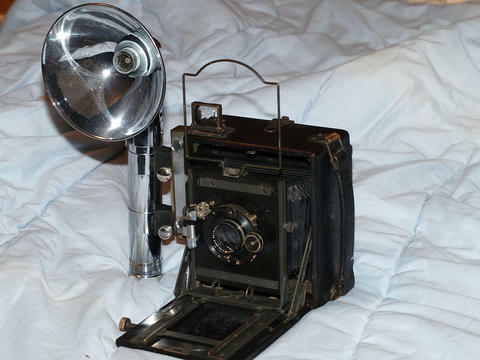 I also found a Heiland flash to complete the look, though it looks like the Heiland flash has a slightly different connector to the Speed Graphic (perhaps it is made for a slightly different Speed Graphic from a different era). The Speed Graphic and flash are definately the classic look. As a side note, the flashes from cameras of this era have often been made into Star Wars light sabers. 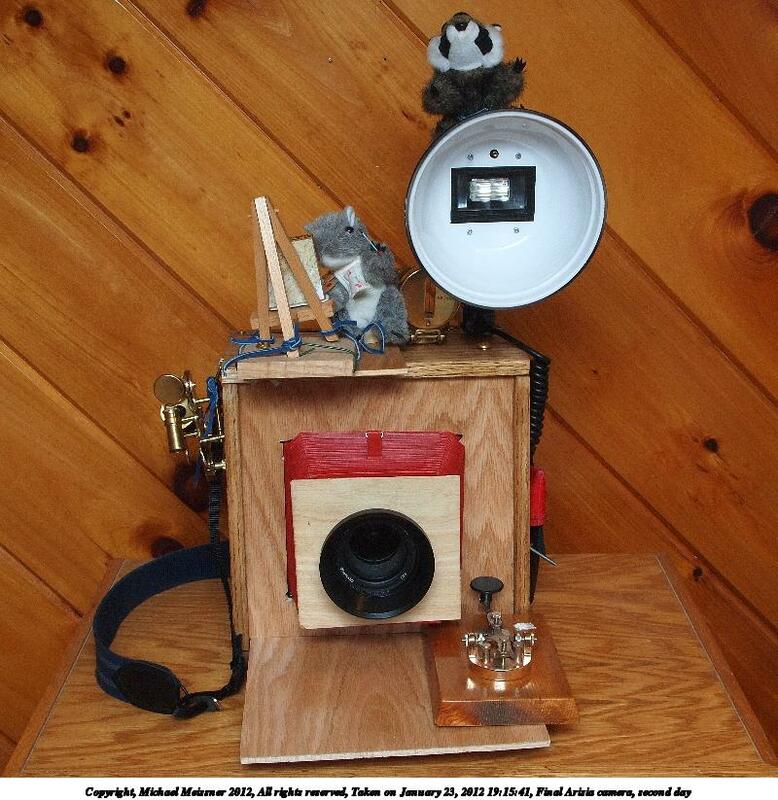 I have more pictures of the Speed Graphic at http://www.the-meissners.org/albums/camera-hacks/index.html#sgraphic. When I was looking at putting my Olympus E-P2 inside of the Folmer Grafex Speed Graphic 4x5 camera, I came to the conclusion that 4x6 bodies are just too small to fit the E-P2, and that I needed to step up from a 4x5 camera to a larger camera. 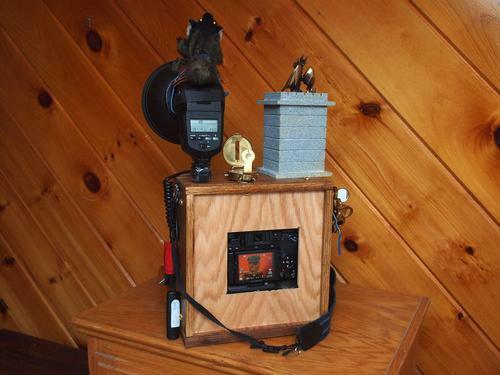 There just isn't enough room inside of the body to accomidate the digital cameras. The E-P2 body is a rather tight squeeze, but the lens is off center, and would not fit into the lens board. 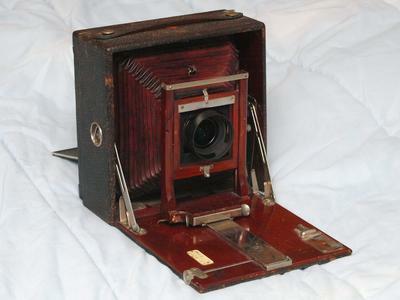 Eventually I won an auction for a Kodak Pony Premo 5x7 large format camera from around 1910-1915. I removed the lens from the Kodak camera, and the Kodak body is just big enough to hold the E-P2 inside with the E-P2 14-42mm lens fitting through the lens board. I would not be able to use any of my other lenses in this setup, since they are much larger, unless I enlarged the openning in the lens board. 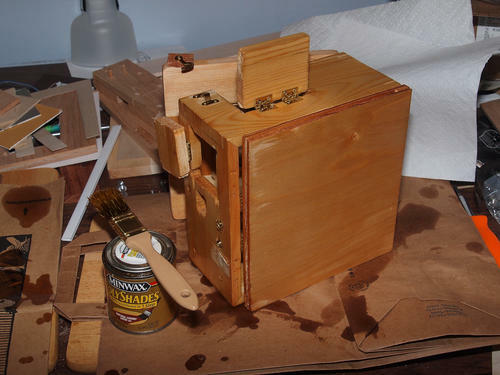 So far, I have been loath to make any permanent to the Kodak body. Orignally I mounted the E-P2 camera outside of the Kodak body, but eventually I fashioned some wooden supports that fit inside the body. I can now close the back of the camera when it is off. Because I have to adjust the bellows manually to accomidate the zooming the lens, it means I generally shoot with the gear as a fixed lens camera, and I have to position the camera to get the shot I want, rather than zooming in or out. 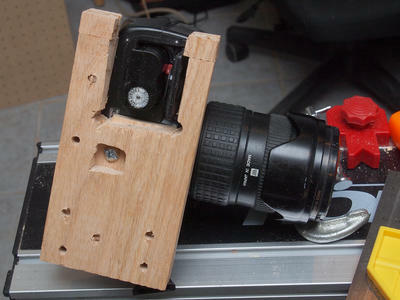 I have a lens shade made for Leica lenses that extends beyond the lens board and hides seeing the camera inside. 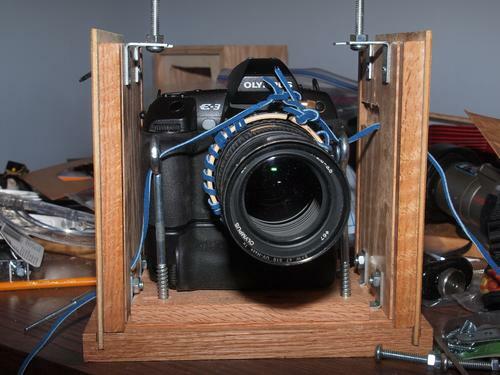 It looks cool, but often it catches on the lens board and prevents the lens from focusing. When I did the Connecticut renaissance faire, I left off the lens shade and it focused a lot easier. I also was able to zoom the lens somewhat by reaching through the back and rotating the lens. A friend of mine who has shot with view cameras says I should put a black cloth like they use when you are manually focusing the camera on a tripod. I tend to prefer leaving the LCD visible, because it is easier to shoot. 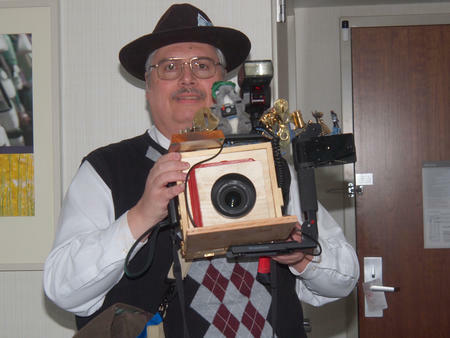 Also, when people come up to me, they often assume it is just a prop that I'm holding, and I can swing it arround to show the digital camera inside. 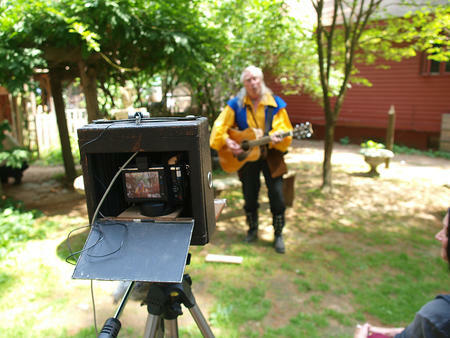 The E-P2 has one serious design flaw, and that is the wired shutter release connects on the right side where you hold the camera. Inside of the Kodak body, the camera is jammed right against the right side so that the lens will fit through the lens board, and so I can't use an electronic shutter release. 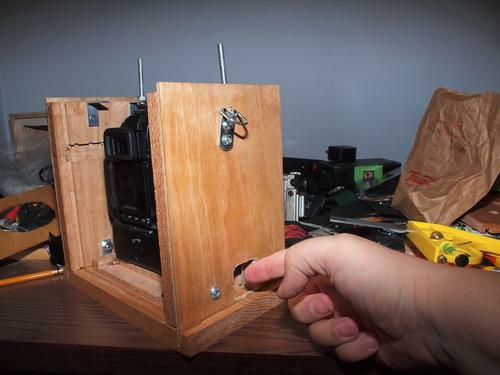 I have cobbled together a mechanical shutter release that I attach over the shutter button, and it allows me to shoot the camera without reaching inside the box. Kodak Pony Premo alone: http://www.the-meissners.org/albums/camera-hacks/index.html#premo. 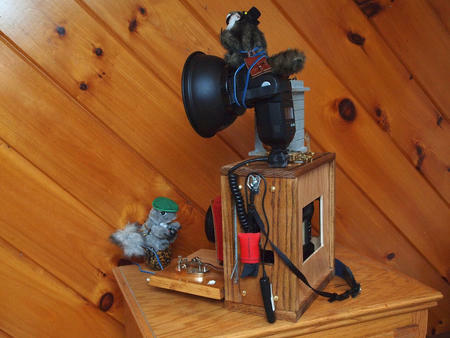 I need to drill various holes for shutter release cables, adding flash, etc. and I really don't want to mod the old bodies. For this generation of the box, I bought a wooden shadow box from the craft store Michaels. I've gone through a few boxes. Most of the work on the box is with hand tools. For the next generation of the box, I will be making the box from scratch, and using power tools like a table saw and router. I picked up a red bellows from ebay that I will use in the build. 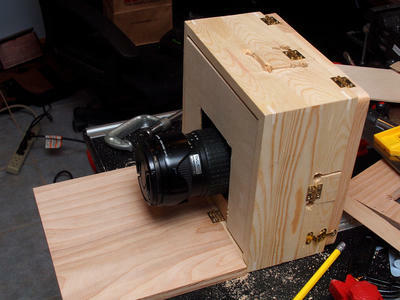 The bellows are a little on the big side at the front, and I will have to fashion some sort of lens board. Alternatively, I could learn how to make bellows and make a smaller set or adapt existing lens shades that come with bellows. 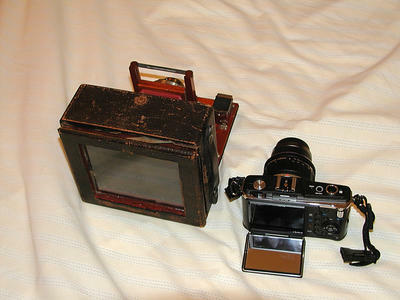 After seeing the Seneca and Kodak bodies, I want red bellows, and not boring black. One of the features of this generation of the camera setup is there is a hole on the bottom so that I can remove the battery and change it. In practice this isn't that convenient because you generally have to tip the camera on the side to get the batteries out. While I disliked the battery grip on my E-1 because it changed the size of the camera, I did break down and get the HLD-4 grip for the E-3 for the next generation of box. The HLD-4 can hold 2 batteries, so it will last longer between changing batteries, and because it opens to the back, I won't have to tip the box over to get the batteries out. The side has an opening so that I can change memory cards without taking the camera out of the box. In the next generation, I probably won't have a hole for changing memory, instead, I will make it much easier to remove the camera from the box. Here are pictures of my current setup. 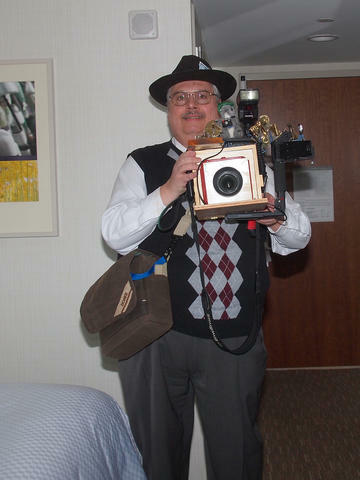 I've taken this setup to the 2011 Arisia science fiction convention, some steampunk events, and a few renaissance faires.